The world outside is still dark, and the village merely a collection of indistinct shapes and muffled sounds. The day is cold and damp, the kitchen a place of shadows in early morning light. My doddering bones and aching joints protest the season, and summer seems like just a lovely dream from long ago and very far away. How does one banish winter for a few minutes? Looking for a fine hot potion to start the day and drown my doldrums, I rattle around in the larder, opening canister after canister and sniffing them appreciatively. French roast? Maxwell House? Earl Grey? Constant Comment? Northern Delights Cloudberry (Arpiqutik) or Crowberry (Paurngaqutik)? Rooibos? Ginseng? Lapsang Souchong? Perhaps a simple Orange Pekoe? The last container holds dried chrysanthemum buds, and it is way in the back of the cupboard, rustling gently. When I open it, the dry golden fragrance of last summer wafts out, and for a moment, I hear tinkling bells and exotic musics. Ah, this is the tisane (liang cha or 凉茶) we will quaff this morning. 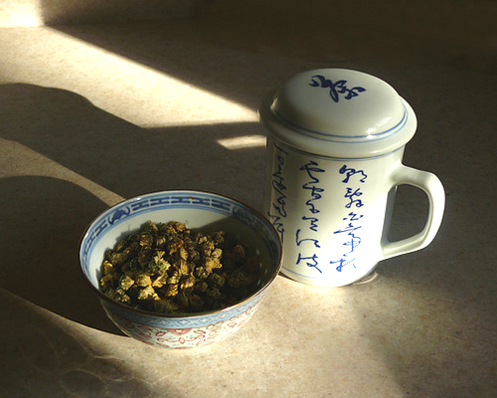 Waiting for the kettle to whistle, I do a little whistling of my own and glance at the long shadows falling across my favorite mug and the little Chinese bowl of chrysanthemum buds on the counter. The shadows contrast wonderfully with the fragile porcelain and its aromatic holdings; there is light on the verges of their inclination. Forget winter and darkness, this morning scene is perfect just as it is. Tea anyone? Good morning and an early Happy New Year to you! We drink this very tea at the yarn store and the customers love it! Many have never tried it before. It is truly one of the magic teas. Your cup make it looks ever so elegant! You have made me feel much better already and I had coffee. Tea this afternoon! no tea now (midnight soon! ), thanks. BUT a big THANK YOU for your postings throughout the year and times.... I can't always read and digest, taste and enjoy them straight after you publish but this post made an impression and I also wish you and your husband a HEALTHY, peaceful, happy and joy-filled New Year.